Dr. Nisarg Shah has done M.D.S. in Oral & Maxillofacial surgery from Bombay University in 1976. He has been in practice since 1976 and has vast experience in various treatment modalities of dentistry. 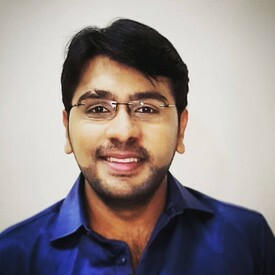 Dr. Nisarg Shah is attached to Shreedevi Hospital, Kalyan and Kaushalya Medical Foundation Hospital Thane, Jupiter Hospitals, Thane as Consultant Maxillo-facial Surgeon. Besides he also visits private nursing homes for carrying various surgical procedures. He is the Director and promoter of “The Dental Clinic” which is ISO 9001- 2008 certified. Successfully passed a certificate course on Dental Implantology, Bone Augmentation and Biomaterials from Lille University, Paris in July 20011. Set up a full volume DIVYADRISHTI CBCT 3D Maxillofacial Cone Beam CT Imaging Center at Mulund, Mumbai in APRIL 2012. 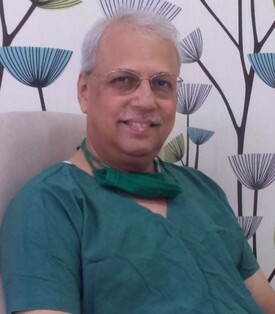 As a member of Rotary Club of Thane (Main) since 1997 he has participated in several medical / dental check-up camps, and many other community service projects. 2. Dental Implants and bone grafts and augmentation including sinus lift surgeries. 3. Oral cysts and Benign Tumors in the jaw bones and other areas of mouth. 6. General dentistry including Root Canal Treatment & conservative dentistry. 10. Diseases of TM Joint and facial pain management. 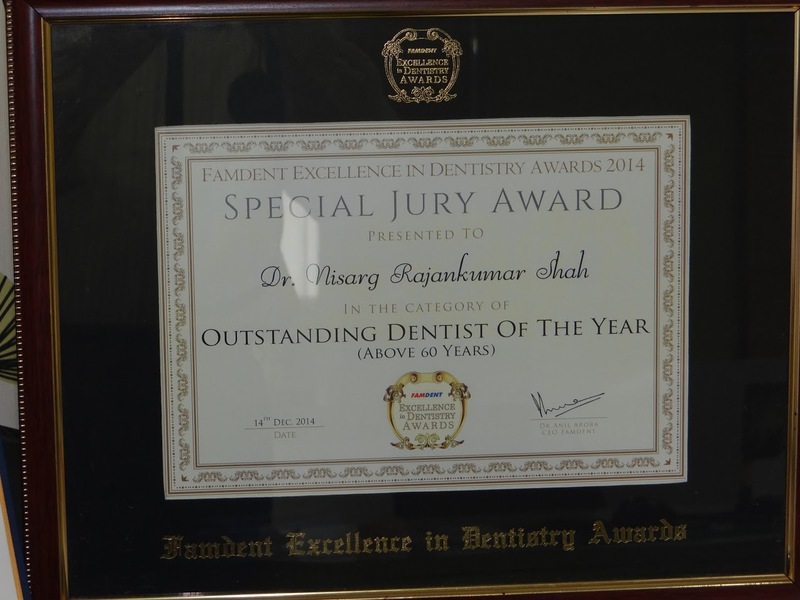 Recipient of OUTSTANDING DENTAL SURGEON ( ORAL – MAXILLOFACIAL SURGERY) 2014 FROM FAMDENT. o For growth analysis we have provision of taking Cephalogram X-Ray & Cephalometric Analysis. o For Endodontic investigations we have a dedicated RVG (Radio-Visiography) which gives instant x-ray on the computer thus facilitating quality treatment. o An Electronic Apex locater further facilitates the Root-Canal Treatment. o The clinic is sterilized with an Autoclave Sterilizer which aids infection control. o Our group lecture facility helps create awareness of good oral hygiene amongst general public as well as educates them about quality dental treatment. o To refine skills of our fellow colleagues’ in the dental fraternity, continuous dental education programs are conducted on models and extracted teeth. o An added strength of our clinic is that our infection control procedures have been certified by Haffkine institute, Mumbai which prevents cross infection thus protecting the patients and staff. 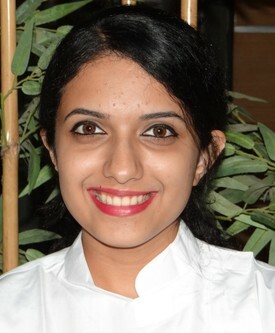 Dr. Keyur Mehta is a name to reckon with in the field of orthodontics. He belongs to the generation next of this profession. He is the product of PGIMER, Chandigarh; logically boast of the best in Asia. He keeps himself abreast with the latest techniques and innovations. He is a certified Lingual orthodontist from AIIMS, New Delhi and has been trained under stalwarts in the field. His fields of interest include. 1. Managing patients with cleft lip & palate and special needs. 2. Invisible braces in adults including Lingual braces & Clear aligners (Invisalign). 3. Growth modification to correct the improper jaw position. 4. Treating skeletal deformities wherein orthognathic surgery may be required to correct the jaw bases. After his stint as a junior resident at PGIMER, Chandigarh he’s with us for a couple of years. He is sharp, intelligent & technically skilled with fineness to the precision. A scientifically disciplined professional by nature he works on each & every individual with complete dedication and high clinical standard. His work s peaks for himself and we are a proud to have him with us. •TO GAIN GOOD CLINICAL EXPERIENCE AND KNOWLEDGE ABOUT THE SUBJECT ALONG WITH LEARNING NEW ADVANCEMENT IN THE FIELD OF DENTISTRY AND KEEP MYSELF UPDATING ABOUT IT AND APPYING IT INTO MY DAILY PRACTISE.